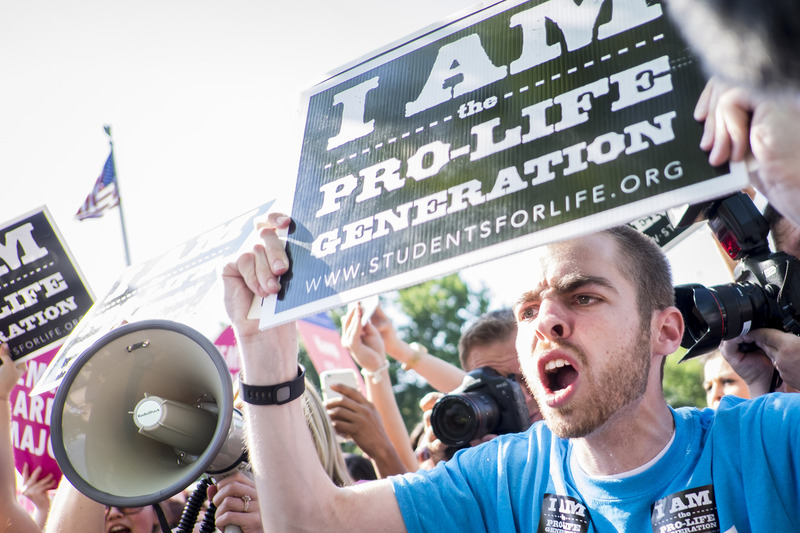 After SCOTUS' HB2 Ruling, What Will Anti-Choicers Try Next? The Supreme Court just struck a blow for abortion rights with Whole Women's Health v. Hellerstedt , and everyone pro-choice is partying. But as Jessica Mason Pieklo of Rewire News tells Bustle, before we get too excited, we should be viewing this victory as what it really is: An important building block in the abortion fight. The decision didn't magically eliminate all barriers to abortion access in the U.S., and "the anti-choice crew," as she puts it, is definitely hard at work coming up with new strategies to advance their agenda. First, the good news: In this case, the Supreme Court struck down two controversial sections of HB2, a Texas bill which transparently attempted to limit access to abortion in the name of "patient safety," a premise previously unchallenged in the court. The first is a provision that abortion providers have agreements with hospitals within 30 miles allowing them to admit patients. For providers in urban areas with multiple hospitals, maybe that's not so onerous, but in rural and poor communities, there might not even be a hospital within 30 miles of a clinic, or they might refuse admitting privileges to abortion providers. Religious hospitals, especially Catholic ones, are rapidly expanding their networks, and they don't look kindly on abortion care. The law also reclassified abortion clinics as "ambulatory surgical centers," regardless of whether they perform surgical abortions or not. That meant meeting extremely strict and costly code requirements to stay open, which is why the number of abortion clinics in Texas shrunk rapidly following HB2. It's also why the Supreme Court determined that these measures constituted an "undue burden," which would make them illegal, and why Ruth Bader Ginsberg specifically called them out as "impediments to abortion." That's good news, because it sends a clear signal to states with similar laws on the books: We're onto you. Pieklo got into more detail during our conversation, explaining that the court finally took on the oft-repeated claim that such laws are necessary to protect patient health. "[Anti-choicers have been] building off reasoning from 2007 and Gonzales v. Carhart , which upheld the Federal Partial Birth Abortion Act, a specific pre-viability ban targeted at a specific procedure in the name of patient safety," she tells Bustle. "Really, for the first time since Gonzales opened the door to playing fast and loose with patient safety, the Supreme Court has put the brakes on that." "I think we’re going to see a pivot back toward fetal-pain-type arguments, heartbeat bans, sliding the viability scale further and further back under the guise of personhood. At that point, that’s the last sort of hook that they have, and frankly it's one that even the liberals on the court have shown some squeamishness about." So what happens after the Supreme Court says that legislators can no longer hide behind the fig leaf of patient health? Do anti-choicers pack up their balls and go home? Not a chance, says Pieklo. Instead, they switch tactics. Remember when "personhood" bills were all the rage a few years ago? "The next part of it would have to be advancing interests in potential fetal life. I think we’re going to see a pivot back toward fetal-pain-type arguments, heartbeat bans, sliding the viability scale further and further back under the guise of personhood. At that point, that’s the last sort of hook that they have, and frankly it's one that even the liberals on the court have shown some squeamishness about." Anti-choicers, she notes, are masters of cut and paste legislature, and have "notebooks" worth of laws that they can dump on legislatures in conservative states. For politicians, it's a win-win, because they can simultaneously drum up attention and funding for elections while trying to limit access to abortion. If patient-care-centered laws aren't going to fly — and there's still no guarantee that the court would rule similarly in related cases — it's time to return to the drawing board and sharpen another prong of attack. We're already seeing this in Utah, where a truly bizarre fetal pain bill requires physicians to administer anesthesia for 20+ week abortion procedures. This is a tactic which blends a number of tools from the anti-choice library. It dials up the squick factor by making people view these fetuses as humans capable of feeling pain (researchers generally agree that perception of pain doesn't begin any earlier than 28 weeks), while also telling doctors how to practice medicine in a very sinister way. The use of anesthesia adds substantially to the risk, complexity, and cost of a medical procedure, serving to make it more difficult to access, and for no good reason. Anti-choicers are eagerly watching to see what happens next, even as they draft copycat legislation that would have the effect of radically reducing access to abortions after 20 weeks — and that's in states where they're legal in the first place. Texas doesn't need to pass such a law, for example, because it has an incredibly strict 20-week ban. She also predicts that we're going to see a rise in religious refusals — an especially worrying concern, given the growth of the Catholic hospital industry. As long as care providers can refuse to participate in abortions, it doesn't matter if TRAP laws are struck down. Religious refusals also highlight the profound role that money plays in this issue: If you have it, your chances of getting an abortion are much, much higher. That's something anti-choicers will also be betting on, she says, believing that attacks on Planned Parenthood and Title X funding are going to continue even as the Hyde Amendment remains intact. The "mental gymnastics" at work in the court, she says, have allowed it to convince itself that the government isn't restricting access to health care for poor people ... they just don't have access to care! "Can [pro-choicers] build on this one, or is it a one-off?" Pieklo asks. "I want to build on it. I want to see abortion rights jurisprudence continue along the lines of this opinion," noting that it took the form of a frank, clear, proactive document, rather than a reactive defense of abortion rights. If pro-choicers want to keep building, though, we need to be committed to the long haul, and she warns that includes mobilizing to the hit the polls on Election Day. Because it's not just about this Supreme Court and this decision, but the larger future of American jurisprudence that's at stake.